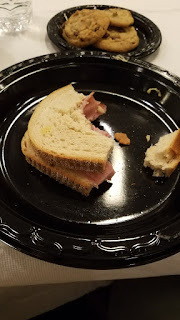 The food at the UFT's Executive Board meetings used to be much better than it is now. I remember dropping by there a few years ago and dining on roast beef and turkey with awesome gravy. I dropped by again this past September and was a bit disappointed to find something claiming to be a corn beef sandwich wrapped up in some tin foil. I come from a southern Italian household. In a household like mine, the type of food your serve to your guests says something about how much you value their presence in your home. Under these rules, if your guests are esteemed and you know their presence will add value to your family, then you prepare a special gravy for their arrival (Italian-Americans way of referring to that tomato sauce we're famous for). You make sure the bread is perfect and fresh and you take your time selecting the wine. The process is very fair. My family never makes these decisions based on how rich or fancy our guests are. We always rate our guests on how they conducted themselves the last time we saw them and and on what value we think they will actually bring to our table. And in our house, that value is measured by conversation. If we know a guest is going to bring good, worthy, engaging conversation to our home, then we prepare a fine, home cooked meal. If, however, we are afraid our guests are going to waste our time, then we whip up some sandwiches. The food all depends on the guests. I'm not, of course, sure this if this how the UFT does things. I am just noticing the differences in food. Oh, also this week, the UFT Executive Board happens to have a very good guest coming over. Emily James is a NYC public school teacher and a parent. She is responsible for a petition advocating for paid maternity leave that has garnered just under 80,000 signatures of both activists and non-activists, teachers and non teachers and politicians and average residents. The petition, including the public scrutiny that is has brought to the issue of paid maternity leave for teachers, has been described as nothing short of miraculous. This lady figuratively came out of nowhere. Armed only with her own experiences of a wrong that she had to endure and with her ability to communicate (via keyboard) using the written word, she has brought together tens of thousands of people in an effort that much of the city has taken notice of. That effort will eventually change NYC policy toward paying its school teachers for family care forever. Whoever this lady is, she's amazing. She is not a unionist, but she will be speaking to the UFT's Executive Board on 9/25 where she will present her petition (with exactly 78,119 supporting it) to UFT leadership. Upon learning this, the MORE/NA caucus of the UFT decided it would be a good time to also present its own petition from last year advocating for paid maternity leave. The petition has raised roughly 3,000 signatures of support. No word on what type of food the UFT will serve on Monday.